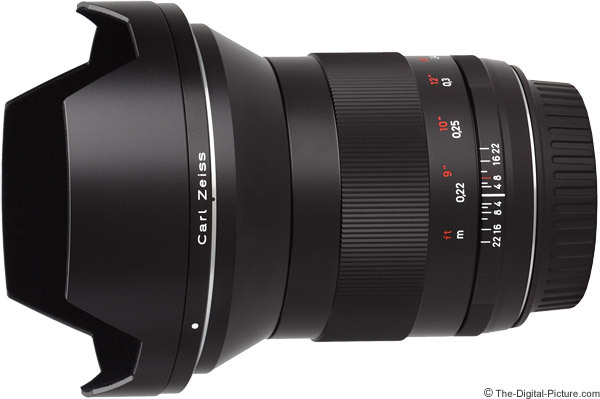 Note: The Zeiss 21mm f/2.8 Classic Lens has been replaced by the Zeiss 21mm f/2.8 Milvus Lens. If you are going to ask this much money for a manual focus-only prime (fixed focal length) lens, it better be good. And the Zeiss 21mm f/2.8 Distagon T* ZE Lens is indeed that good - I'm impressed. If the Zeiss ZE 21 is not the best wide angle lens available, it is definitely a very close contender to the ultimate wide angle lens. The Zeiss 21mm f/2.8 Distagon T* ZE Lens review began just prior to my leaving for a landscape photography trip to the American Southwest - a trip that was costly both in terms of effort and expense. I knew I was going to be using wide angles a lot and the legendary Zeiss 21 in the new ZE Canon mount promised to be a good choice for this trip. 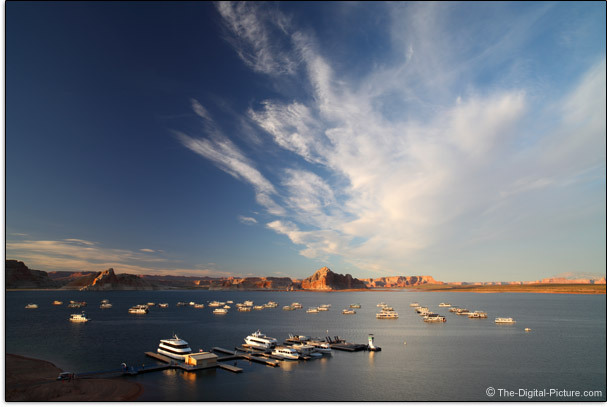 The Wahweap Marina as seen from the Lake Powell Resort through the glass of the Zeiss 21mm f/2.8 Distagon T* ZE Lens. Having already owned the Zeiss 85mm f/1.4 ZE Planar Lens, I knew what to expect from a ZE lens physically. And I was not disappointed in any way. 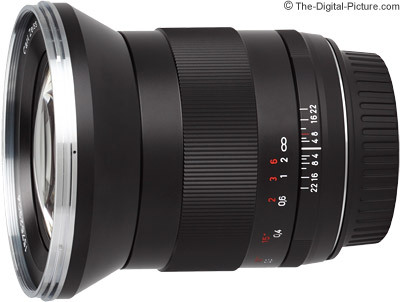 This lens is extremely-precisely and solidly built. Like the ZE 85, the ZE 21 exterior is entirely metal (no rubber or plastic) and glass. Lacking autofocus and image stabilization, the Zeiss 21mm f/2.8 Distagon T* ZE Lens has exactly zero buttons and switches. The entire smooth/straight part of the lens barrel is focus ring except for a just-barely-adequately-sized area to grip the lens for mounting/unmounting. The lens does not extend during focusing. The filter threads do not rotate. 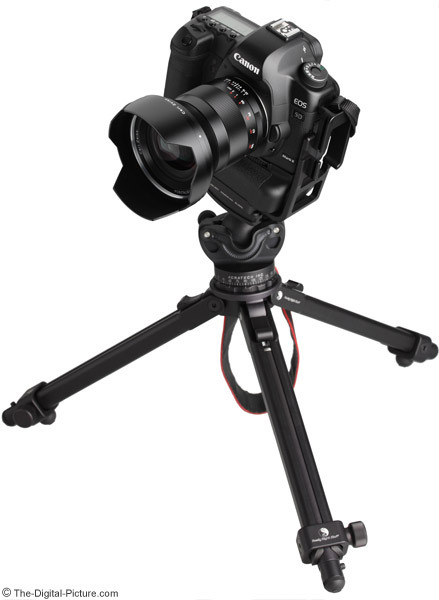 Only the focus ring moves - and it very smoothly, very precisely rotates in a 81° arc. Infinity focus is a hard stop (no focusing past infinity). This is as good as focus rings get - there is no play whatsoever. Again, there is no rubber on this ring - it is all metal. Engraved distance markings on the MF ring are accurate and line up to engraved DOF markings. Canon EOS DSLRs will signal when proper ZE 21 focus is achieved via the viewfinder focus indicator light and beep (if enabled). 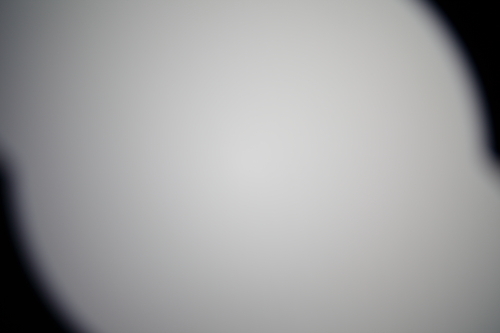 I found these indicators, though not super precise, to be quite effective with this lens. I feel the need to use words like "sculpted" to describe the parts of this lens - the included Carl Zeiss metal lens hood in this case. The hood has a precise fit and stores very compactly when reversed. Note that proper hood alignment is required during installation - the ZE 21 hood can be installed in 3 positions, but two result in full frame vignetting as illustrated below. Simply use the small black and white alignment dots (visible in the product image) and you will not encounter this problem. Or just remember that "Carl Zeiss" goes on top. A classy-looking center-and-side-pinch lens cap finishes off the Zeiss ZE 21 appearance. Build it with metal and it will weigh more than a plastic-built equivalent lens. I'll take the extra weight in this case. A lens this size with this weight feels solid and reasonably compact - it is comfortable to carry and use - it handles well. Here is a visual size comparison of some similar lenses. Pictured above and below from left to right are the Canon EF 20mm f/2.8 USM Lens, Zeiss 21mm f/2.8 ZE Distagon Lens, Canon EF 24mm f/1.4 L II USM Lens, Canon TS-E 24mm f/3.5 L II Lens and Canon EF 16-35mm f/2.8 L II USM Lens. 82mm is a relatively large filter size, but a couple of the version II wide angle Canon L Lenses take this size as well. So, the review thus far has established the Zeiss 21mm f/2.8 Distagon T* ZE Lens' top-of-the-line build quality - but that is not what impresses me the most about the ZE 21. Image sharpness/resolution/contrast, even wide open on a full frame body, right into the extreme corners, is what I'm most pleased with. I'll give the ZE 21 two enthusiastic thumbs-up in this regard. Aside from the Canon EF 20mm f/2.8, the other compared-to lenses in this review are also very impressive, but when the full frame corners are reached, the Zeiss stands out somewhat from the others - with the Canon TS-E 24mm f/3.5 L II Lens being an exception (it is basically equivalent in sharpness). 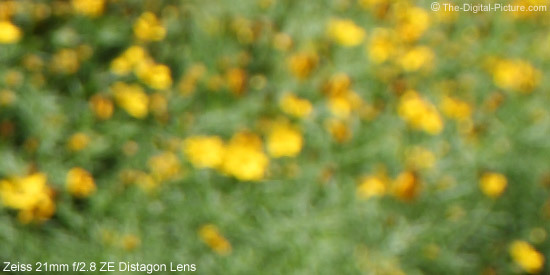 Here is an outdoor comparison of the absolute top-left portion of a Canon EOS 5D Mark II frame. Wide open vignetting is very strong in this location, so a second, 1-stop brighter, wide open example is provided. 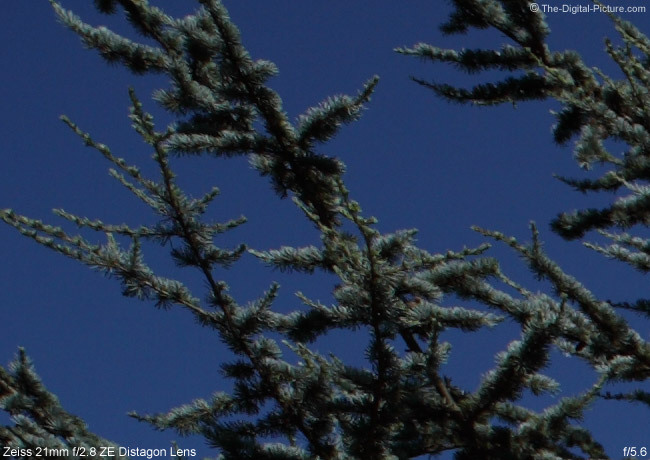 Click on the image below to see an image quality comparison between the Zeiss and four Canon lenses. The ZE 21 and TS-E 24 L II are the winners in this comparison with the EF 24 L II very close behind. 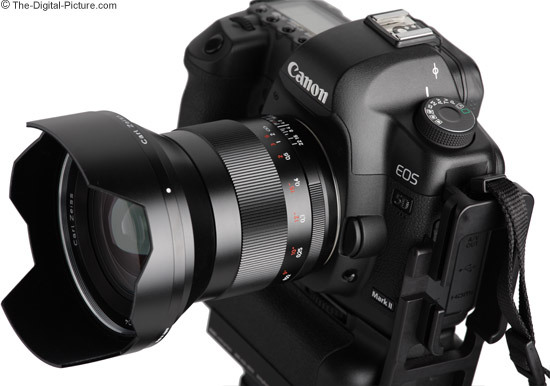 The 16-35 L II is next and the EF 20 f/2.8 is last. I'll give more image quality comparisons between these lenses in this review, but want to remind you of the obvious - each of these lenses has at least one or more particular advantages over the others. The EF 20 is the least expensive - it costs significantly less than any of the others. The EF 16-35 L II offers a nice range of focal lengths. The EF 24 L II has a much wider aperture available than the other lenses. All three of these lenses have autofocus. The TS-E 24 L II has the tilt/shift features. The ZE 21 costs somewhat less than the TS-E 24 L II. The effects of vignetting are very apparent in the above comparison. 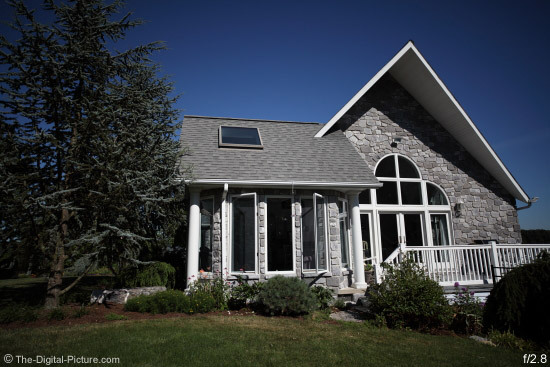 Wide aperture wide angle lenses frequently show strong vignetting in full frame image corner. And the Zeiss 21mm f/2.8 Distagon T* ZE Lens is no exception with about 3.5 stops of light lost in the corners. As usual, less vignetting is seen at smaller apertures - a big difference exists between f/2.8 and f/5.6 in this example. Also as usual with a full-frame-compatible lens, APS-C (1.6x FOVCF) camera bodies will avoid most of this vignetting. Distortion in the Zeiss ZE 21 is not strong but is the hard-to-remove wave/mustache type barrel distortion that curls outward again at the corners. A straight line (edge of a building, horizon over an ocean) running along the top edge of the frame will appear wavy - like a very wide, short, rounded letter W. Without the straight line near a frame edge, the distortion is not noticeable. The ZE 21's distortion is very similar in shape to the Canon EF 20mm f/2.8 Lens' distortion, but is slightly stronger in the corners. The Canon EF 24mm f/1.4 L II Lens has less distortion. The Canon TS-E 24mm f/3.5 L II Lens has even less distortion (practically none). The Canon EF 16-35mm f/2.8 L II Lens has stronger barrel distortion than the ZE 21, but has a more-easily corrected bulge-type of distortion. CA (Chromatic Aberration) is impressively low. The TS-E 24mm L II is practically identical in this regard - maybe the tiniest amount more. The EF 24 L II has very slightly more CA in full frame corners. CA becomes a bit more noticeable in full frame corners in the EF 16-35 L II images (not bad at all) and becomes very noticeable in EF 20mm f/2.8 images - noticeable even on APS-C 1.6x bodies. Although lens flare can create an interesting effect in an image, I usually do not want it to be visible in my final images. And flare can be a very difficult image defect to remove during post processing. The Zeiss 21mm f/2.8 Distagon T* ZE Lens does have a tendency to show some flare, noticeably so at narrow apertures. View the "Flare" test results to see this lens' flare response with your own eyes. The TS-E 24 L II is the most flare-free lens in my test group. Overall, I would give second prize the the EF 24 L II and third to the Zeiss 21. The EF 16-35 L II and EF 20 f/2.8 show the most flare. It is hard to compare bokeh (background blur quality) from lenses with difference focal lengths, but here is an attempt. The tripod was in a fixed position, which means that longer focal length lenses should create a more strongly-blurred background. And in this case, the two 24mm lenses indeed create a stronger background blur. The Canon EF 20mm Lens frames wider than the Zeiss 21mm lens, so you can expect slightly less blur from this lens and the EXIF-reported 20mm setting of the Canon EF 16-35 L II Lens framed an even wider scene than the Canon 20. These test shots were taken at f/5.6 while focused on the same, close foreground subject. The Zeiss 21mm f/2.8 Distagon T* ZE Lens bokeh appears nice to me. Keep in mind that to get a significantly-blurred background when using a wide angle lens requires a wide aperture, a short focus distance and a long distance to the background. Even at 650px wide on your monitor, the background does not go strongly out of focus on this poolside-portrait. Now you want to know why I included the shutter speeds for these shots. The shutter speed has no effect on the background blur (unless the background or the camera is moving - creating motion blur), but I want to use this example to illustrate an issue I am having with this lens. Notice how much brighter the f/4 and f/8 shots are? About 1/3 stop brighter. While I can expect vignetting to be clearing at f/4, why are the f/5.6, f/11 and f/16 shots darker? These images were taken within 6 seconds and I can assure you that the light did not change this dramatically within the 1 second intervals between identically-exposed photos. Here is another example. Clear sky. All shots taken within 23 seconds. In this example, the f/4 shot is noticeably brighter and the f/5.6 shot is slightly too bright compared to the narrower-aperture shots. It is not unusual to see a little exposure variation between shots, but it is unusual to see this much. Testing revealed that at f/4, every second expose is 1/3 stop brighter than the previous. At f/5.6 and f/8, about 33% of the exposures are 1/3 stop brighter than the rest. All exposure settings remained constant throughout the testing. The problem is evident and repeatable on both the 5D II and 1Ds III bodies. Zeiss' response to this issue was "according to ISO standard, a deviance of 1/3 EV of the aperture is within tolerances. Normally, our lenses should be below this deviance." with a suggestion to contact my local Zeiss representative. I'll send this lens in for service to find out if the exposure accuracy issue can be resolved - I expect that it will be. Update: Zeiss promptly replaced my lens with a new lens - and the new model works properly. 8.7" (220mm) is a short minimum focus distance, but with a wide angle focal length, the Zeiss 21mm f/2.8 Distagon T* ZE Lens does not put a very big maximum magnification number on the board. I do not see the moderately low .15x MM value to be an issue for most people - you can still get dramatic close-up perspectives with this lens. I borrowed the following focal length comparison from the Canon EF 16-35mm f/2.8 L II USM Lens. Use the 20mm setting to get an idea of how the angle of view from a 21mm angle compares that of the other focal lengths shown. Next I'll borrow from the Canon EF 24mm f/1.4 L II USM Lens Review: The wider a lens is, the harder it is to create an excellent composition. But, done perfectly, wide compositions can be especially stunning. The 21mm focal length is wide enough to show a wide angle perspective - emphasizing the foreground subject, de-emphasizing but retaining the background (making background details appear smaller but sharper) and creating a sense of presence. But, 21mm is not so wide that subjects/uses for the focal length are hard to find. Even on a full frame body. Landscape photography is the first Zeiss 21mm f/2.8 Distagon T* ZE Lens use that jumps out at me. This lens will take in wide scenes and deliver sharp corners even on a full frame body. Landscape photography typically involves motionless (or near motionless) subjects that allow for careful manual focus (use Live View for best results). A 21mm lens is very good for creating dramatic perspectives, but that is not often what you want for portrait photography. If you shoot a portrait at 8.7" (220mm), whatever is closest to the lens is going to appear larger than you (or the subject) want it to. But, shoot full body portraits and people in their environment and the Zeiss ZE 21's results are great. 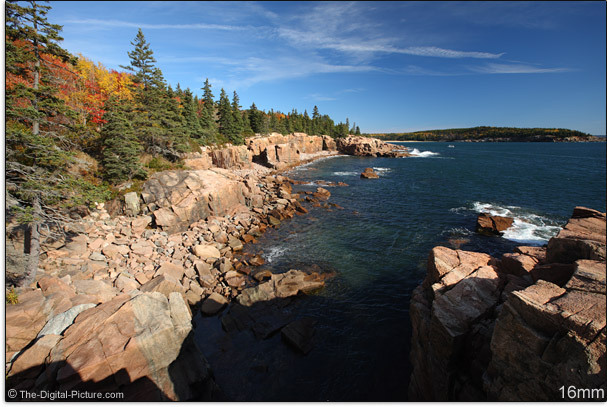 See the girl-on-the-rock sample picture above as an example of an environmental portrait. As in landscape photography, carefully setup portrait images can easily be taken using manual focus. The wave distortion negatively impacts the Zeiss 21mm f/2.8 Distagon T* ZE Lens' otherwise excellent architectural photography capabilities. There are many other great uses for the Zeiss 21mm f/2.8 Distagon T* ZE Lens - I'll let you match your own to the very impressive image and build quality of this relatively expensive, highly recommended, manual focus lens.